Want to pull off with paver blocks production in the market? We are here at your service to assist you to set up your own production units. With the rapid growth and advancement in our civilisation and living standards, we have continuously kept the rate of developments on an increasing trail with evolution. With more ideas and improvements in the building and landscape trends and culture, there has been rising demands for artistic paver block. The most essential combination to any landscaping project is the hardscape works included. There lies the production demand for paver blocks that comes in different colours, size, shape and strength in accordance to the suitable architecture in plan. The latest block designs are preferred with an artistic blend in correspondence to the architect’s hard landscaping concept. We can help you to assemble and produce your own production process as we are one of the leading manufacturers of the machineries involved in the process. Our successful varieties of products that includes the complete package for mini-paver plant, semi mechanised paver plant, and the fully automatic paving machine. We provide the complete components and units for the mini paver plant available with us. The wide range of components include 2 vibroforming tables, a pan mixer and a concrete mixer with hydraulic hooper. The entire capacity of this mini paver plant is estimated to be 3500-4000 moulds per day. The expected labour assistance would be for 8 hours in a day. This plant can be used for tile manufacturing with multi-tasking specifications and can provide high performance with a large volume of production. The vibrating table is the unit that deals with the processing and assembling of the manufacturing units. 8 mm plates with 3000 holes. 3 working tables with the machine dimensions of 10 x 2.75 x 2.96 ft.
Accommodates large processing area for 2 x 2 ft. tiles throughout the 26 ft. long machine. Facilitates automatic movement of rubber moulds for a production capacity of 3000 Sq. ft. / 8 hours shift for tile manufacturing and 2000 Sq. ft. / 8 hours shift for interlocking paver blocks. This is the color mixer accessory machine used for manufacturing tiles that requires colour layer mixing. 200 litres of volume space. Plate thickness of 10 mm at the bottom and 8 mm sides. Works on a 3 HP motor. Integrated with a reduction gear box system with SKF bearing. This is the most essential unit of the entire system that involves with the major concrete mixing and filling process. 700 litres of volume capacity. Required feeder hooper capacity with a capacity of 400 litres in addition to the unit. 16 RPM rotational speed of the Muller. Muller specifications in terms of plate thickness are 12 mm at the bottom and 10 mm along the sides. Integrated with an open type gear box system with SKF bearing. The paver production machineries are often required by the manufacturers out there who has already established their business or the start-up projects about to be developed. Here’s why upcoming manufacturers should consider quoting us before setting up the machineries and units. The invincible longing years of our experience in the area of paver productions. Since 1993, we have successfully been able to maintain our reputation by providing good quality machineries and products. The quality of our machineries are characterised by itself in terms of durability, efficiency and strength. We do not just handle the service till the delivery, but we also provide continuous support after the setup with regards to maintenance of our products. We have our technical assistance team along with you to help you set up the plant. From the traditional concept of having completely symmetrical blocks, we have reached the era that overrides the norms by adapting towards custom unsymmetrical blocks being used all over the designing approach. We are the manufacturers of several such exotic moulds that contribute to the current design trends being used over the build. Our paver block moulds are designed to produce the most natural and elegant blocks in the market. With the development of machineries and units in the business, we look forward to contribute more and remain prominent in the market. Manufacturing has become one of the high growing sectors in India. Indian government had launched the ‘Make in India’ program to place India on the peak of the world economy status as a special zone of manufacturing hub and give considerable global recognition to the future Indian economy. India is expected to upsurge a large economy by the end of year 2020. 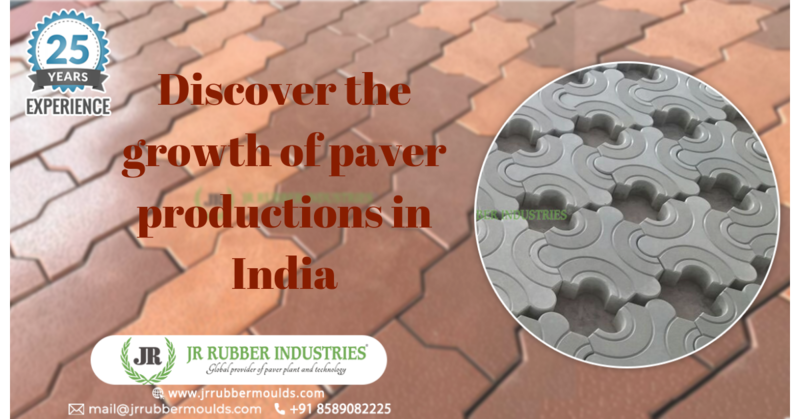 India has a sound market status for growing pavers productions. Do you remember the good old times when we used to play in the soil in front or at the backyard of our traditional house? Things always changes for a good reason to upgrade with and now all houses and industries have started applying pavers like floor tiles in their ground spaces for beauty and other considerable benefits. Block paving has become a trend in modern construction structure. This will aids us in providing more beautiful and clean surrounding as well as not allowing harm insects to stay or enter the home or factory premises. Nowadays the use of paver blocks and tile moulds are drastically increasing as it has been widely used everywhere from our houses to office buildings. It has become a vital part in today’s landscaping idea and urban building structures. 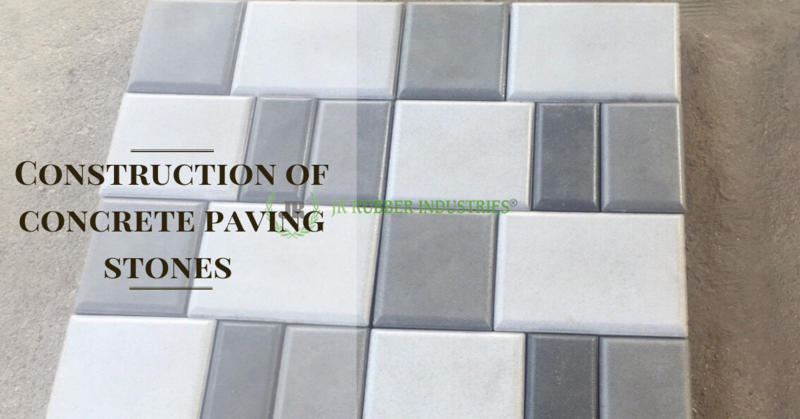 Paver products have been broadly used for pavement of parking areas in large to small buildings, food courts and parks, railways stations, bus stands, compound area of shopping malls, driveways in every cities and pedestrian walk areas. They are well liked by almost every innovative builders since they are made available in many different designs and styles as per customer preference and their needs. They are made in factories in an economical way that gives many financial benefits to the producers and buyers, hence they can be very easily customised according to the customers budget and preference. Even at the low cost of production, Indian industries are trying had to provide with their customers, the most supreme quality of products since they face a large competition from available different alternatives in the market. The main notable benefits of this tile are they are really easy to maintain because for their design patterns and helps in replacing the existing surroundings without causing any distress to the same. Moreover they are produced in a plethora of styles, shapes and of different colors as per your prefered construction theme. Now every builders or those who have plan to build home by their own conceives different ideas of construction. So the paver products manufacturers have to consider all these needs to satisfy their customers. Then only they can retain their existing customers and attract prospective clients. They are very easy to install and are made of most guaranteed and durable materials. A drastic change has been accompanied by the evolving trend or evolution of technology in every streams. Everything from small and portable mobile devices to heavy building materials has been completely changed to an unbelievable techniques. But the current generation is not careless as the past generation in opting from the different alternatives. They are highly concerned about the environmental issues and the concerning hindrances associated with the production of every materials. And at the same time they are aware about the new innovations in technology and they want everything to be get done in the more faster and efficient way to make their tasks simpler and effective. They also have a varied and unique choice over others and never unhold the significance kept with the importance of quality in production. The changing needs people exhibiting in every areas have also done with paver demands. They are seeking for every single details and need perfect and unique of everything. Even paving blocks have been in the market for a long time, we have been witnessing a huge change in the landscape revamping trends. People are preferring more natural shades that represents earthy colours over bright colours (Bright red, yellow and white). Pavers that easily combine in with natural tones are generally gaining popularity in the market. Due to its foregone attractiveness over a long time, flashy coloured pavers are rarely preferred by the builders. 2019 is going to see a plethora of random designs of varied appealing nature. 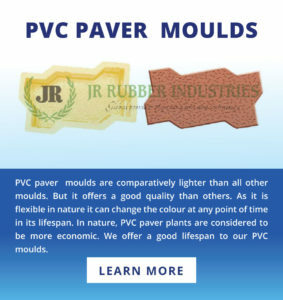 At JR industries, we have paver moulds of rubber, plastic paver moulds and pvc paver moulds. We consider these materials for the effective paver production because of their properties such as durability and quality in output. And the productions are made in an environment friendly manner. The plastic we use in paver moulds are recycled plastic wastes. This will somehow helpful in reducing wastes. A production which considers every single details in exhibiting the efficiency is our ultimate focus. JR Rubber Industries having an excellence of 25 years and exhibited to be one of the best paver producing company in the world. With a long years of experience, JR is being on the top and stands high in the paver production industry. We have different variants of paver plant starting from Mini automatic plant, Semi automatic plant and Fully automatic paver plant that provides most preferable chance to build the different level of moulds with supreme quality and high durability. All the moulds we produced are with high quality and have a promised lifespan of 12 to 15 years. Here are some important benefits why you can opt JR Rubber Industries for paver production with a plethora of paver block designs India. 4. There is no need to wash the molds, still it will maintain the paver shape. We avail you with innovative and creative styles for products with long lasting durability. We are specialized in a variety of paver products. What makes us acceptable over other industries is our commitment and teamwork that helps us in providing with the best of everything at the most reasonable rate than ever before. 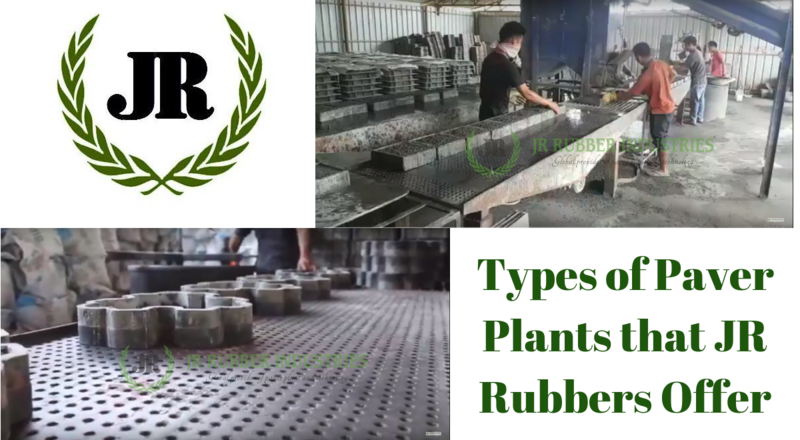 If you are in search for the premium quality products for your pavement or in search for a good reliable paver production plant then JR Rubber Industries will be the best companion for you. Visit our office or ring us for further information. Feel free to contact us on +91 95622 82225. JR rubber moulds, being the leading paver mould producers and paver plant installation, has successfully completed the 25th year in paver mould production industry. We are a company that provided support to 30+ countries including African, GCC and South East Asian countries. We provide complete solution for exterior paver flooring with manufacturing and supply of moulds and machineries. On this proud moment, we are trying to pass on the basic informations about what we are doing at the paver productions. Here are the details of Concrete Paving stones constructions. Paving stones are kind of an floor tiles used to arrange the ground to get a clean look and comfortable usage. These pavers are created by concrete and can be customized to any design as per client requirement. From JR Rubbers perspective, we have the paving stone mould production which is durable and long lasting. We also provide paver plant installation for all kind of companies as per the client’s requirement. Paving stone production starts by segregating the pre-requisites and this process requires below resources. JR Rubber moulds is capable of providing automatic paver plants which provide fully automated workflow and no need of any manual intervention. However, we will be concentrating here on the paving stone production. The first phase is to create the mixer for paver using the concrete miller. The mixer is created by mixing the cement with crusher dust sand, baby chips and water. SMF powder and Color Oxides are used in the pavement production. SMF is a well-known superplasticizer used in paver production around the world. It is a high-end water reducer in order to provide the maximum durability to pavers. SMF powder widely used for all types in all types of grouts, mortars, coating and as a component of the concrete admixtures and emulsions. The usage ratio is 2-4 gram per 1 kg. Color oxides are mainly used for offering the necessary colors to the tiles, it will make the paving designs visually more attractive. There is also chemicals added in it will which make the paver harder for improving the lifespan. The fully automatic paving machine is a lifesaver for business as it reduces the need of manpower and increases the efficiency by producing 25000 wet cast paver/day. This automatic paver creation will prevent the duplication and waste of material handling which assure the right use of resources. This plant introduced for the first time in the world and JR is the most renowned machinery manufacturer in India. JR rubber having an experience of 25 years and proved to be one of the best paver making company in the world. Even after 25 years of experience, JR is standing on top and high in the paver creation field. We have Mini, Semi, Fully automatic paver plant that provides an option to build the different level of moulds with high quality and durability. All the moulds we created with utmost quality and have a guaranteed lifespan of 12 to 15 years. Here are some major points why to choose JR for paver production. Feel free to call us on +91 8589 082 225. Along with paver productions support, we also care for the maintenance of the pavers and here are some of the tips that will help to take care of concrete pavers and its regularly reported issues. We often see that pavers at footpath, compounds and even at home surrounding that many pavers are either broken or uneven. It often causes some disturbance to many passengers or ourselves when we walk over or near to it. However, We often neglect it because this issue might not under us to solve or we don’t know what to do. Hence, we are providing you with the solution to a few problems that usually occur during the lifespan of pavers. These solutions can be used at your paver filled compounds. Here are the problems and solutions for the paver issues. We often find uneven pavers at public places which is not so comfortable to walk by. However, the reason behind this problem in the base itself. The base may not be filled properly or the mixer had an uneven thickness. If the site has clay soil, then it will hold a lot of water than soil. The existence of more water in the soil will make way to displace the original position of pavers. During the winter time when the ground freeze, the soil will expand more and push the paver up. However, when the soil comes back to normal position, The pavers may stay at the same high since they cannot move down without a good amount of force from the other side. Solution: Unfortunately, we cannot fix it easily. Hence, we will have to redo the paver installation by clearing the stone dust under the paver. It often observes that most paver production unit use stone dust for the base preparation as a setting bed. Stone dust is a screening by-product that used for having some gravel pits. However, the main problem with stone dust is that it breaks into fine dust form when its installed under the paver. This dust holds a lot of water and can form a clay soil when it freezes. Solution: The ideal way to make composite to have even compaction is by using ¾ processed gravel that has various size particles. However, there is no way to repair the existing uneven paver other than starting over the whole process. You would have noticed that many pavers don’t have the correct edge and those are on the edge of breaking since no setting bed is available under the pavers. Solution: A filter fabric usage under the base and bringing up the sides of project excavator will prevent this issue. Unlike the uneven paver heights, this issue can be fixed by the particular area without completely starting over. Filter fabric can be fixed for each paver and new base can be added for paver reinstallment. The main reason for a settled paver land is lack of compaction. This phenomena is often seen on a nearby site where house or pools are constructed. The backfilled soil are mostly not contacted when they filled. It is common that the ground under the paver dug up and not filled properly. Solution: We are do following for fixing this issue. The main reason for this issues is that no edge restraints are installed to keep the pattern together. Solution: There are 2 type of edge restraints are available in the market for paver installation. The most used type in indian land is PVC edging restraints that used during paver installation. It spiked into the base of the gravel where paver is installed. For fixing this settled issue, paver need to take out, more sand and base need to be filled with proper compaction and at the end an edge restraint need to be installed in order to rectify paver settle issue. Water is puddling on the paver. There could be 2 reason for this issue. The base may not be built at a proper pitch and may have build at a slightly low spot. The base was not compacted well and the land settled over the time. Solution: The only way to fix this issue is to pull up the paver area that settled and add more base and grave to compact the land before reinstalling the pavers. The reason for this issue is that pavers are not installed with joint sand and that resulted into a setting bed. Solution: When pavers are completely laid, the concrete sand or polymeric sand is poured into all joints. Next to that vibratory plate compactor should run over the pavers. More sand is required to top off the joints and project is compacted 2 or 3 times. 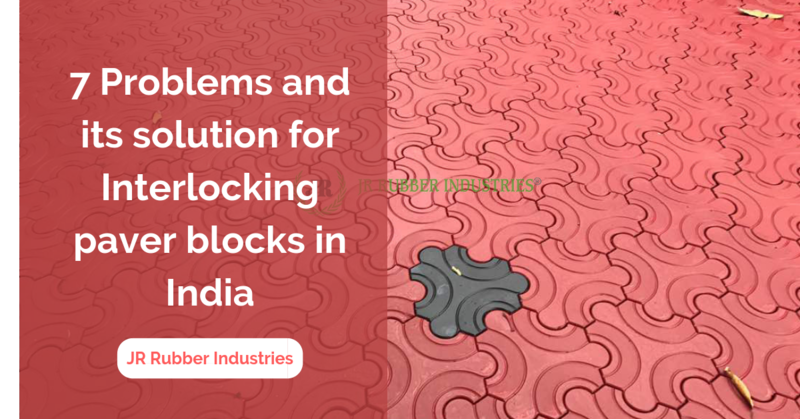 So the next time you find an unorganized pavers in a public space, at home surrounding or at factories, you might able to know the reason behind it and can even figure out the solution to it. AS already mentioned, JR rubber Industries is a company that leading the production of paver and paver block machine in india & around the globe. 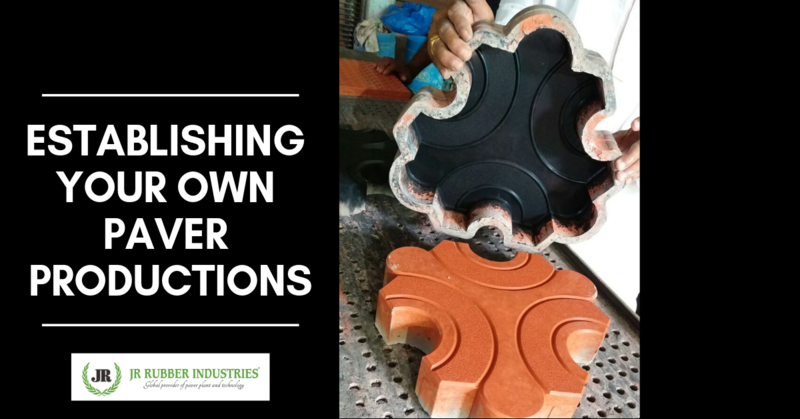 We started our paver mould manufacturing units in a place called Thrissur, India. 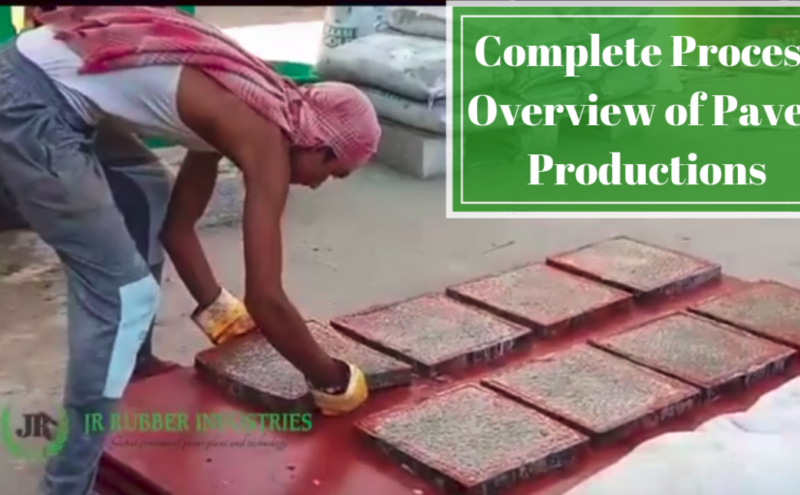 We provide the complete solution for flooring industry with the manufacture and supply of moulds, supply of paver machinery, setting chemicals and color oxides and complete technical assistance for paver production with in plant trainings and onsite support. We are your one stop destination for all your paver production needs. Rubber paver mould tiles. The outer layer of a mould is the identical material of automobile tyres. As the moulds do not have a strong and healthy application like tyres, the lifespan of moulds is almost boundless. 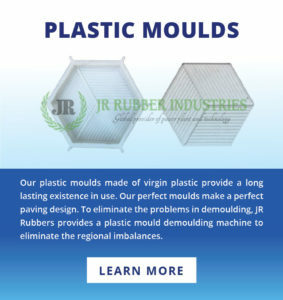 JR polypropylene plastic moulds are created using virgin plastic material which has a longer lifespan than any other polypropylene moulds available in the industry which are made from the reusable plastic material. They always keep a shape and very less prone to breakage. We source the perfect machinery for our customers from the best manufacturers. We provide a wide range of production line – mini paver plant, semi-mechanized paver plant, fully automatic paver plant which are suitable for all kind of production capacities. The key machinery being used for this is vibro table or otherwise known as vibrofoming tables. Paver productions was too hard and time-consuming in its early years. Paver production workers used to do all the production process manually without any machinery help. However, as innovation progresses, machines started to replace a lot of work that man used to do. From automating some part of paver production, Engineers developed paver plants that can do the whole process of its own by one switch. 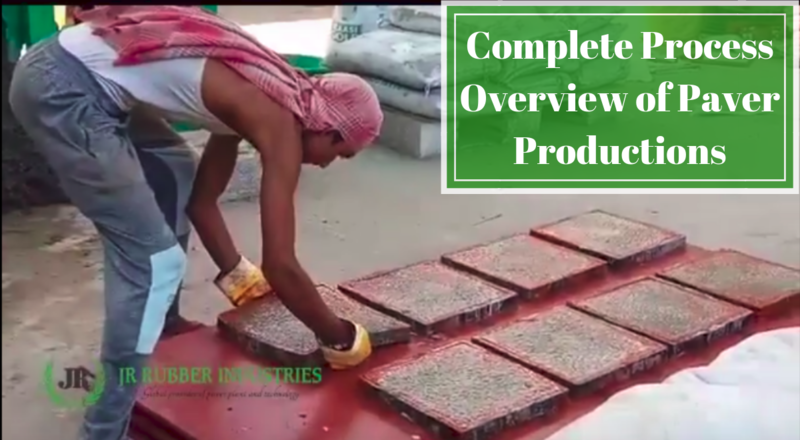 Our Engineers at JR Rubbers produce 3 kinds of Paver plants for the client as per their requirement. 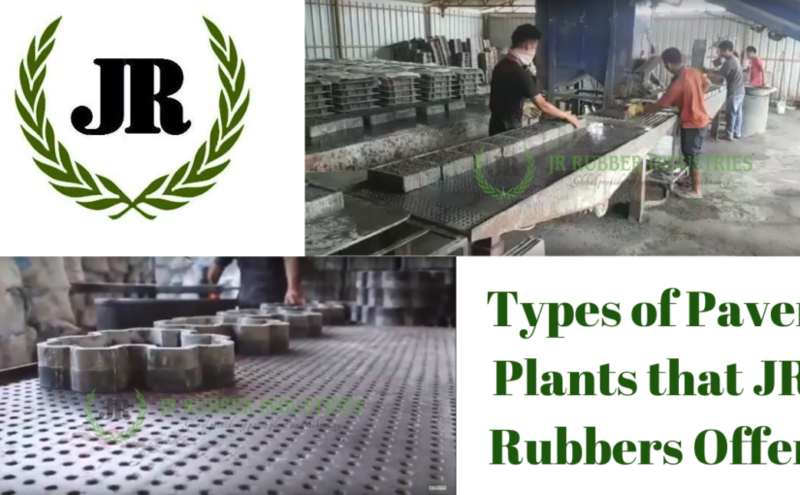 Following are the 2 types of Paver plant that JR Rubbers build for the customer. These paver plants are built at the client location as per the requirement from customer. Mini Paver plant is for the smaller paver producing companies who need comparatively lesser paver needs. This plant is automated in the different department, however, need several manual interventions during the paver production time. Semi-Mechanized Paver Plant is the semi-automated plant which apt for a medium paver producing company. Semi Paver plant needs lesser manual interventions during the paver production process compared to mini paver plant. This plant can produce the much better unit of pavers as the specifications are higher than a mini plant. 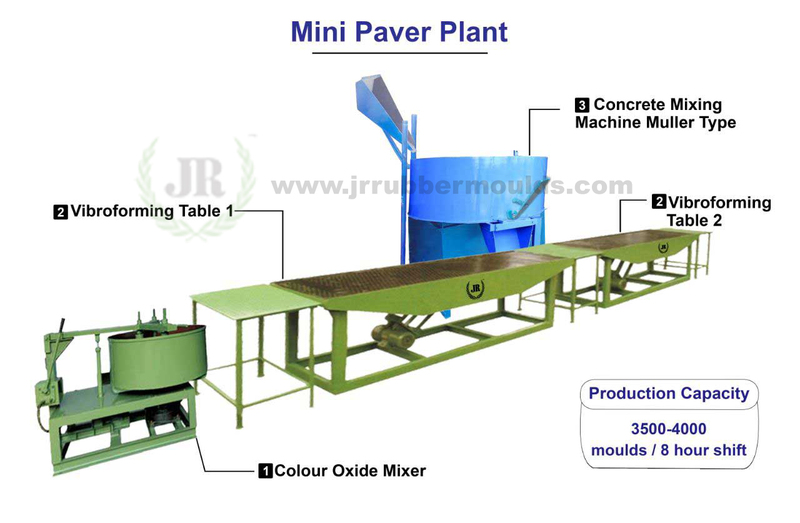 Fully Automatic Paver Plant is the most effective paver plant that produced by JR Rubbers. This paver plant does whole paver production process automatically and no manual intervention needed for continuing the workflow. Due to its extensive features, automatic paver plant produce the higher amount of paver compare to other 2 types of paver plants. Below are the pavers that these plants are capable of building. Mini Paver plant is a paver/tile production with multitasking specifications. It is a high-performance paver plant with the capacity of performing large variety of tasks in the field. This plant has the capacity to build various level or pavers with a production capability of 3500-4000 moulds during the normal 8-hour shift. Mini paver plant is basically for the small paver units. This plant needs manual intervention quite sometime during the paver production. Considering the low purchase cost, mini paver plant is famous among the upcoming paver business units. Have a balancing capacity of 150kg batch with a volume of 200-litre capacity. Having the strength of 3 horsepower electric motors with a bottom plate of 10mm and 8mm plate at the sideline. 500 km Hydraulic Muller type Grey Mixer machine. Concrete mixing machine with a capacity of 500 kg and 700-litre volume. 7.5 HP and 750 KG and have a diamond of 55” Dia, 16” depth. 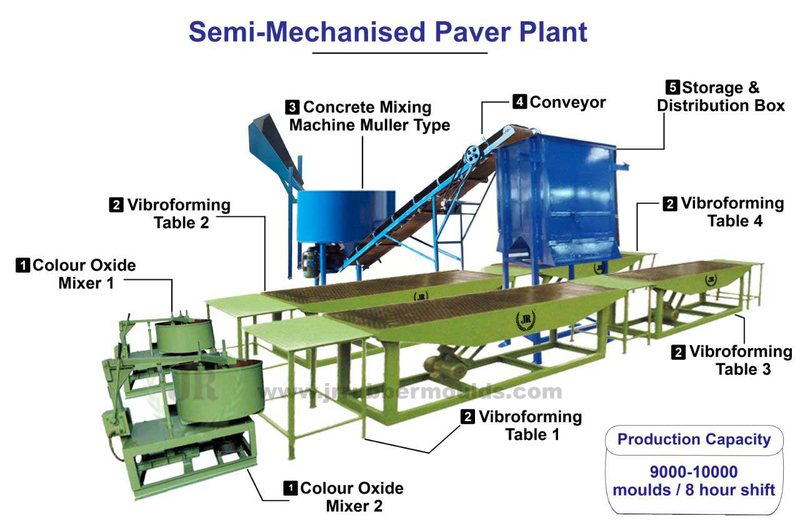 Semi paver plant used for the production of paver or tile production. This machine can offer a high performance and can handle multiple tasks and it offer an option to produce different level of pavers pant with a capacity of 9000 to 10000 moulds/8 hour shift. Semi Paver Plant is majorly required for medium sized paver units who can afford little better than mini paver plant. Semi paver plant is more powerful and efficient compared to its minor version. Having a power of 3 HP electric motors with a bottom plate of 10mm and 8mm plate at the sideline. Concrete mixing process with a capacity of 500 kg & 700-litre volume. Feeder hopper with a capacity up to 400 litres. The fully automatic machine is an ultimate for business as it reduces manpower requirement and increases the efficiency by producing 25000 wet cast paver/day. Its automatic paver creation will refrain the duplication and waste of material handling which confirms the correct use of resources. This automatic paver plant introduced for the first time in the world by the most renowned manufacturer in India. Fully automatic paver plant is the best paver producing plant JR Rubber produced as of now. This plant doesn’t require manual intervention and can produce the highest rate of pavers within a daytime. This is basically intended for the bigger paver manufacturing units. Here are a few features of the fully automatic plant. JR rubbers being one of the best paver making company in the world is celebrating their silver jubilee in paver making field. Even after 25 years of experience, JR is standing on top and high in the paver manufacturing field. We have Mini, Semi, Fully automatic paver plant that offers an option to build different level of moulds with high quality and durability. 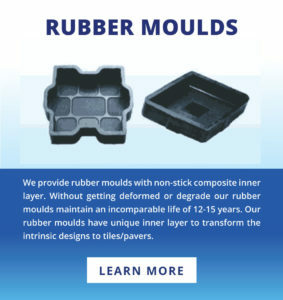 All the moulds we created with utmost quality and have a guaranteed lifespan of 12 – 15 years. Here are some major points on why to choose JR for paver production. There is no requirement to wash the molds, still, it will keep the shape.